Former Hawkwind guitarist Huw Lloyd-Langton died last Thursday (December 6th), aged 61, after a two year battle with cancer. 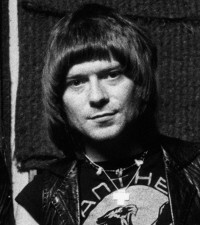 Lloyd-Langton, a Londoner, appeared on Hawkwind’s 1970 debut album before leaving to play with Widowmaker in the ’70s. The guitarist rejoined Hawkwind in 1979 and played with them until 1988, from 1980’s ‘Levitation’ through 1988’s ‘The Xenon Codex’. He continued to make guest appearances with Hawkwind in subsequent years. "Huw had been bravely fighting cancer for a couple of years, but was determined not to let the battle affect his day to day life. He continued to play his guitar, laugh, joke and share the great love he had in his heart, with all who knew him," Hawkwind said in a statement. "Huw was one of the great guitarists with an individual style and character. He is gone but never forgotten by any of us. He will live on in our music and in our hearts."